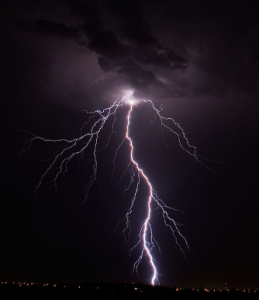 Grounding the coax cable with a coaxial lighting surge protector will protect your equipment from voltage surges created by nearby strikes but not from a direct strike. To protect yourself from a direct strike, attach a lightening arrester to the antenna mast. Connect #8 gauge wire to a copper clad ground rod driving it at least 4 feet into the ground. We would also recommend checking your local electrical codes to make sure you are in compliance or even look into having a professional electrician advise and/or install for you. View this list of recommended antenna installers. Antennas Direct accepts no responsibility for damage from improper grounding.